Whether you're leading your class or advising an extracurricular group, we hope this guide will make the podcasting process easier. Below, you'll find a breakdown of the process and a series of sample lesson plans to ensure that students have the skills and background knowledge to start making a podcast. That's why we've provided a guide for students, covering the same material, here. We recommend dividing the project into stages, listed below. Of course, you and your students are the best judges of what works in your classroom. Submission forms are available now through March 31. Teachers must fill out these forms to submit their students' work. Objective: Students will learn the difference between scripted and Q&A podcasts and familiarize themselves with a wide range of podcast topics. What you need: A computer with speakers and an internet connection. What students need: A pencil and paper. This can be completed as a class activity or by breaking into groups, if students have access to computers or laptops. Start by spending five minutes in a class discussion about podcasts. Gauge what students know or don't know about them by asking a few questions. Where can you hear podcasts? Why would YOU listen to a podcast? What makes a podcaster different from a YouTuber? How does it change the way you tell a story when you're on the phone? How does it change the way you listen when you can't see someone? Have students listen to a few examples of podcasts and radio stories to get a feel for some different podcast examples. In this episode of Kind World, host Erika Lantz uses sounds and interviews with multiple people to tell a story about a friendship. Have students listen to the episode, then start a group conversation. Do they like it? Who did they hear talking in it? What sorts of sounds does it use, besides interviews? Play this story twice. The first time, ask students to make a note of all the sounds they hear and people that speak on tape. Afterwards, have students break into partners or small groups and compare notes. Then, play the story through a second time — having students follow along with the transcript to check their work. Talk briefly about the sounds that they missed the first time. This is a long one, so perhaps just listen to a few minutes at the beginning. (A good place to start is about 30 seconds in.) Have the class discuss what makes this podcast similar or different from the others they've heard. After this discussion, the class should understand that this podcast follows the structure of a Q & A/conversation. Unlike the past two podcasts, this doesn't weave in and out of scripted narration. That's one type of podcast that students can choose to make for the Student Podcast Challenge. What types of sounds do podcasts include? Students should understand that podcasts vary greatly — but most include a host and can include sounds from interviews, audio from events, audio from movies or TV, and sounds from the world around them. What are some ways that podcasts are structured? Students should walk away from this discussion understanding that there isn't one right way to tell a story. Some podcasts use narration from a host or a reporter, others feature a conversation between a group, others might be a one-on-one interview between two people. The structure of a podcast fits its content. Objective: Students will choose a topic for their podcast. *Skip this stage if you're assigning the class a prompt or idea for the podcast. Alternately, use this time as an opportunity for students to brainstorm for that prompt. *If your class is creating podcasts in small groups, have them split into those small groups now and spend the entire class period completing this activity. Distribute copies of the following prompts to students as they work in small groups of 3–5. Tell us a story about your school or community: about something that happened there — recently or in the past — that you want your audience to know about. Explain something that kids understand and grownups don't. Students should narrow down the ideas on the board to one. Use these questions to help. Students should be thinking about specific tasks — interviews, sound recording, or editing — that each podcast idea could involve. What obstacles might come up as we create this podcast? If this idea involves traveling somewhere far away or interviewing someone famous, it might be difficult. Can students complete their interviews or record other sounds well before the podcasts are due — so that they have time to edit the audio? Objective: Students will determine how they'll structure the podcast. What you need: Six large pieces of tear-off construction paper or easel pad paper. What students need: A notebook and writing utensil. What is my story's driving question? What is the story not about? How will I ensure my story is fair to the people and ideas it represents? How will I engage my audience — and hold them? What are my dream ingredients? What will the audience remember when it's over? Start by opening up a class discussion about what types of podcasts students have heard. What are some ways a podcast can be structured? Why might a podcast be a one-on-one conversation, instead of a story told with using clips of multiple interviews? Spend 15 minutes working with students to craft responses to the two questions at the front of the room. Have them raise their hands and give ideas until the group settles on one driving question. Then move on to the second: What is the story not about? The class should have lots of answers to this question and there's no need to settle on one. Then move on to the papers around the room. Students should get up and write a response to each question. If they like someone else's response, they should draw a star next to that response. Tell students to return to their desks after 10 minutes. Once students have finished, have one classmate stand at each paper around the room and share the responses. Then debrief: Given the class's responses, what do students envision their podcast including? What will it NOT include? How will these ideas shape the structure of the podcast — will it feature one long conversation or multiple short interviews? Pieces of tape from interviews and scenes? Keep these posters around to guide students through the podcasting process. When they've recorded interviews and other sounds, remind them to look: this is what they envisioned for the podcast. This lesson is based on a post from NPR Training. Teachers: Here's a downloadable poster from NPR Training you can use in the classroom. Objective: Students will come up with a list of sounds they'll record for their podcast. Play the following radio stories for the class. Directions for students: As you listen, make a note of the sounds you hear — the ones that aren't people speaking — on paper. Ask students: Where is host Rick Ganley? How can you tell? Ask students: Apart from sounds of Edward's narration — what sounds did you hear? How do these sounds help tell Edward's story? Label a large easel pad paper "sounds" and place it at the front of the classroom. Directions for students: In small groups of 3-5 students, come up with a list of three to five sounds you think should be in your class' podcast. Talk about why you think it would help the audience to hear these sounds. Then, have one representative from each group come to the front of the room and write their ideas onto the large paper. Open the discussion up to the class. Have students shout out the sounds that are on the paper more than once. Circle those. Then have students underline those they think are especially unique or worth recording. Keep this paper — it should serve as a guide of the sounds that the class will gather to create the podcast. Objective: Students will familiarize themselves with their equipment, including their recording device. What students need: One phone or voice recorder, one pair of headphones, one computer / per small group. Notebooks and writing utensils. *Before starting, we recommend identifying a) a voice recorder and b) a computer or laptop. 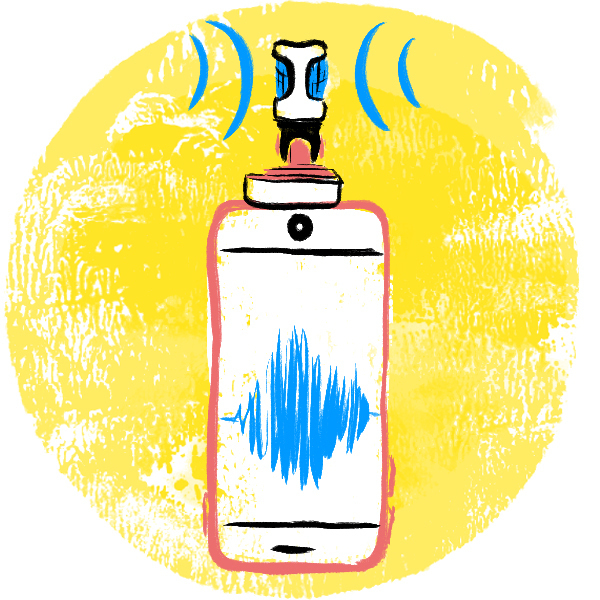 Most smartphones, including iPhones, have built-in voice recorders which can be used for recording narration and interviews for podcasts. In groups of 3–5, have students practice recording themselves and each other. 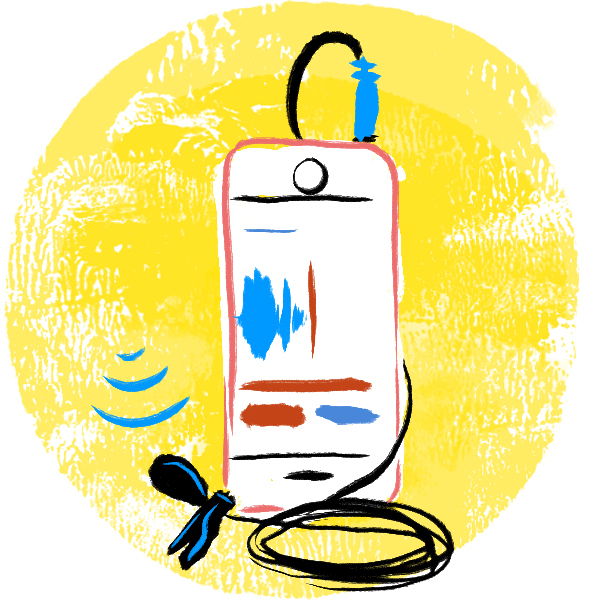 Say your name, grade and age into the microphone, and then listen back to the recording on the phone or recording device. Come up with one interview question for a group member. Record the question and answer. Then, listen back on the phone or recording device. One group member should come up with two interview questions for another. While one person interviews the other, a third group member should record them. Then listen back. Take turns so that each person has a chance to record using the phone or recording device. Each group member should record TWO sounds that last approximately 10 seconds from around the classroom. As a group, listen back to the recordings on the phone or recording device. In the same groups, students should turn to their computers. If your school already uses a sound editing software — like ProTools or Adobe Audition — feel free to keep that and use it. You could also download Audacity, a free audio editing software that students can use to mix their podcasts once they've recorded interviews and sounds. Have students practice saving their recordings into the computer or a drive in a place they can find. Objective: Students will practice asking engaging interview questions while recording. What you need: A computer with sound. What students need: One phone or voice recorder, one pair of headphones, one computer / per pair of partners. Notebooks and writing utensils. *If recording devices are scarce, this is a good time for students to split into smaller groups to plan various aspects of the podcast. While some students practice interviewing, others could research for the podcast or begin drafting a script. Take five minutes to review what student learned in the "recording practice" lesson. Student should remember to 1) ask others to introduce themselves and 2) record their own questions while interviewing. Assign students partners. Designate a Partner 1 and Partner 2 in each set. Set a timer for 15 mins. Partner 1: Ask your partner about the one thing they are most PROUD of. It could be something at home, it could be something at school, it could be something athletic — it doesn't matter. Once they've answered, keep asking questions about their response until the timer goes off. Why are they proud? How did they achieve this? When the timer goes off, turn off the recording and switch. Partner 2, now start recording again — and ask Partner 1 the thing they're most proud of. Don't stop asking questions until the timer goes off. When the timer goes off, turn off the recording. Ask students to raise their hands and share (with their partner's permission) what they learned and what questions they asked in order to learn what they didn't know about their classmates before. Students should use any remaining class time to upload their recordings onto a computer and listen back to as much as they can. They should make notes about parts of the recording that sound clear and strong and those that don't. At this point in the podcasting process, your students should be ready to get out there and record sound. Students should check (and double-check) that they're ready to record before heading to interviews or to record at events. Find our checklist for field recording, which students can take with them, below. Download a checklist for students to take as they prepare to record. Sign up for KQED Teach to access this set of guides to teaching podcasting, from the very beginning. 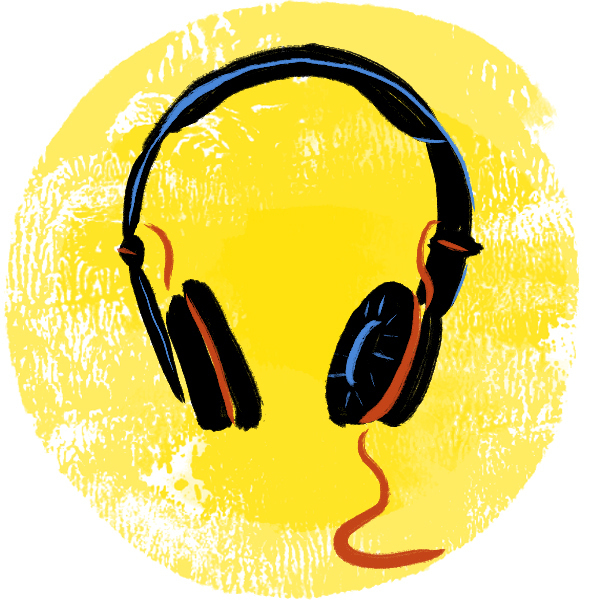 NPR Training is a site full of helpful guides about radio and podcasting. Guides for creating radio and podcasts, from YR Media, are here. This Radio Rookies site lists examples of stories that may be useful to play as examples in the classroom. Transom.org is the go-to site for podcasting hopefuls in public media. If students are looking for help with tools or learning to use sound editing software, this site likely has what they're looking for. Here's Transom's Kid's Guide To Recording Stories. 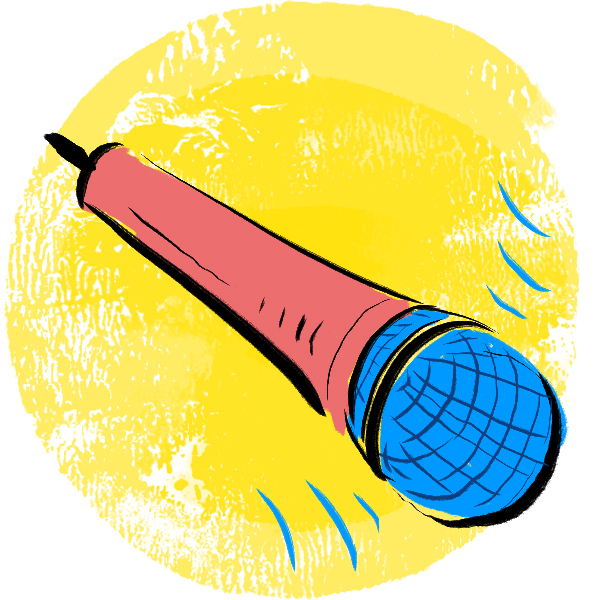 StoryCorps provides a series of lessons on storytelling and interviewing here.